Galway Tech Map: Version 2! It’s been one year since the first version of our Galway Tech Map, so it’s time for an update! Here is the second version of the Galway Tech Map that shows the growing ICT ecosystem in Galway, incorporating feedback from the community over the past year. As before, if your organisation isn’t on the map, you can download a copy and create your own version as we have released it under a CC By Attribution Share Alike license. 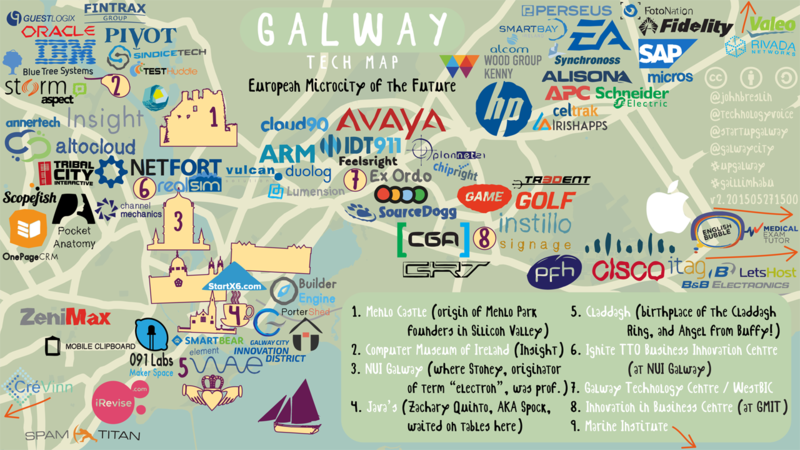 The Galway Tech Map is available in a variety of formats: PNG, PDF, PDF A4. Feel free to share via social media and use in your presentation decks. If you wish to make a suggestion for next year’s version, just send a tweet with the hashtag #upgalway or #gaillimhabú.